The genome data of hg38 should be already configured (How to configure genome data). RNA sequence: A file in FASTA format. For known lncRNAs, you can download their sequences from the UCSC Genome Table Browser. Target regions: A BED file, which contains the regions of interest. Given the RNA sequence and interested regions, it is easy to perform the test with the default arguments. where -r is the lncRNA sequence, -bed is the region of interest, -rn defines the lncRNA name, –organism defines the organism, and -o is the output directory. RNA page: Shows statistics and graphics of candidate DBDs. Target region page: Shows DBSs statistics for all target regions and rankings. Parameters page: Shows the parameters used by TDF. The main page is the RNA, which will display the main statistics regarding the candidate DBDs. Here, you can find which DBD binds significantly to the target regions. 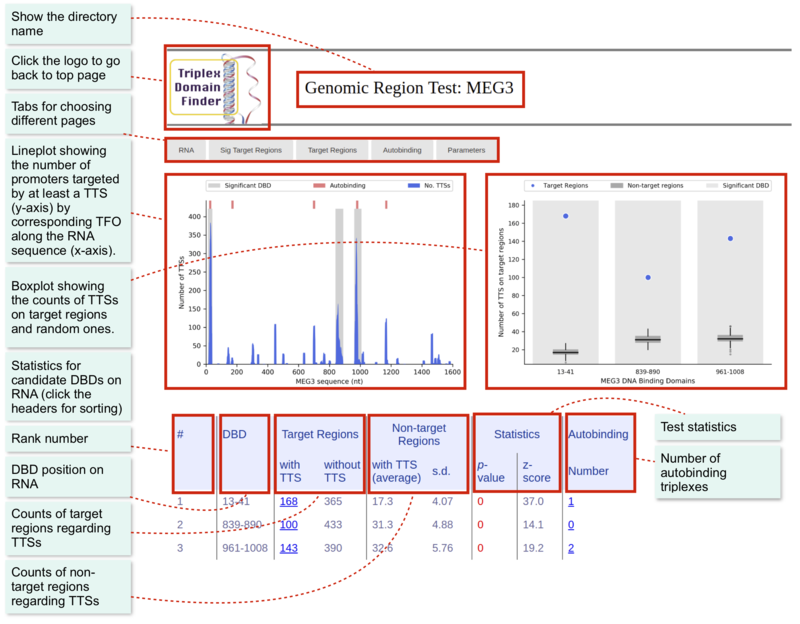 The second page shows the statistics of target regions potentially forming triplexes with a given RNA. It is possible to define the region with the highest binding possibility and its associated gene. We will describe a few relevant options of TDF. See the tool usage for description of all options. How to change the number of randomization? The default randomization processes is performed for 10,000 times. You can change it by the argument -n.
MEG3_target_region_dbs.bed: The target regions which have at least one TTS within it. MEG3_dbss.bed: All TTSs between lncRNA and target regions. The file name MEG3 is defined by output directory name.